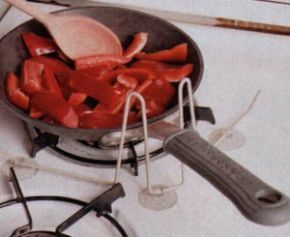 Pan Handle Holder - Reduces Accidental Spills Or Burns. Simple yet effective, this pan handle holder does exactly what it's supposed to, and well. It easily attaches to any cooker hob using the strong suction cups (attached). The wide spread suction base creates even greater stability (while keeping the suction cups away from the heat), and the pan is prevented from moving or turning. The pan holder then allows the pan to be stirred without risk of accidental spills or burns. Works with a wide range of pots and pan sizes.